Cast iron is a standard term which is used for a large family of alloys of ferrous materials. Cast iron is mainly alloy of iron (Fe) which contains higher than 2 % of carbon (C) and more than 1 % of silicon (Si). Low cost of raw materials and relative ease of production make cast iron the last cost engineering material. Cast iron can be cast into intricate shapes since it has excellent fluidity and comparatively low melting point. It can also be alloyed for improvement of corrosion resistance and strength. With suitable alloying, the corrosion resistance of cast iron can equal to or exceed that of stainless steel and nickel (Ni) based alloy. Since outstanding properties are obtained with this low cost engineering material, cast iron finds extensive use in atmospheres which need good corrosion resistance. Services in which cast iron can be used for its good corrosion resistance include water, soils, acids, alkalis, saline solutions, organic compounds, sulphur compounds, and liquid metals. In some cases, alloyed cast iron is the only economical choice for the equipment manufacture. The metallurgy of cast iron is similar to that of steel except that Si in sufficient quantities is present to necessitate use of the Fe-Si-C ternary phase diagram rather than the simple Fe-C binary diagram. 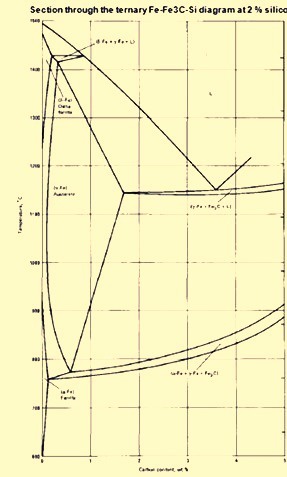 A section of the Fe- Fe3C (iron carbide)-Si ternary diagram at 2 % Si is shown in Fig 1. Iron carbide is also known as cementite. The eutectic and eutectoid points in the Fe-Si-C diagram are both affected with the introduction of Si into the system. With normal Si in the range of 1 % to 3 % in cast irons, eutectic C percentage is related to Si percentage as per the equation “% C + 1/3 (%Si) = 4.3”. In the equation % C is the eutectic C percentage, and % Si is the Si percentage in the cast iron. This metallurgy of cast iron can occur in the metastable Fe-Fe3C system, the stable Fe-graphite system, or both. This causes the microstructure of cast iron to be more complex than that of steel and more susceptible to processing conditions. A significant percentage of C in cast iron separates during solidification and appears as a separate constituent in the microstructure. The percentage of Si in the cast iron has a strong effect on the manner in which C segregates in the microstructure. Higher Si percentage favours the formation of graphite, but lower Si percentage favours the formation of Fe3C. The type of cast iron is determined by the form and shape in which the C occurs in the cast iron. These are (i) white cast iron where C is present as Fe3C, (ii) malleable cast iron which has irregularly shaped nodules of graphite, (iii) gray cast iron where C is present in the form of graphite flakes, (iv) ductile cast iron where C is present in the form of spherical graphite nodules, and (v) compacted graphite cast iron where C is present in short, fat interconnected flakes. Compacted graphite cast iron is intermediate between gray and ductile cast irons. Ferrite is normally a soft constituent, but it can be solid solution hardened by Si. When Si percentage is lower than 3 %, the ferrite matrix can be machined readily, but shows poor wear resistance. At levels of more than 14 % Si, the ferritic matrix becomes very hard and wear resistant which is basically non-machinable. The low C content of the ferrite phase makes hardening difficult. Ferrite can be observed in cast iron upon solidification, but is normally present as the result of special annealing heat treatment. High Si percentage promotes the formation of ferritic matrices in the as-cast condition. Pearlite is a constituent which has alternate layers of ferrite and cementite. It is tough and very strong. The strength, hardness, machinability, and wear resistance of a pearlitic matrix vary with the fineness of its laminations. The C content of pearlite is variable and depends on the analysis of the cast iron and its cooling rate. Bainite has an acicular structure in cast iron which can be obtained by heat treating, alloying, or combinations of these. Bainitic structure provides to the cast iron very high strength at a machinable hardness. Ni, Molybdenum (Mo), manganese (Mn), and chromium (Cr) are generally used to produce martensitic or bainitic structures. Si has a negative effect on martensite formation, because it promotes the formation of pearlite or ferrite. Alloying elements play a noticeable role in the susceptibility of cast iron towards corrosion attack. The alloying elements generally used to improve the corrosion resistance of cast ions include Si, Ni, Cr, Mo, and copper (Cu). Other alloying elements, such as vanadium (V) and titanium (Ti), are sometimes used, but not to the extent of the five elements stated above. Si is the most important alloying element used to improve the corrosion resistance of cast iron. Si is not normally considered an alloying element in cast ion until the percentage is above 3 %. Si percentages in the range of 3 % to 14 % result into some increase in corrosion resistance of the cast iron, but above around 14 %, the corrosion resistance of the cast iron increases dramatically. Si percentages up to 17 % have been used to improve the corrosion resistance of the cast iron further, but Si percentages above 16 % make the cast iron very brittle and difficult to produce. Even at 14 % Si, the strength and ductility of the cast iron is low and special design and manufacturing parameters are needed to produce and use the cast iron. Alloying with Si promotes the formation of strongly adherent surface film in cast iron. Considerable time is needed to establish this film fully on the castings. Therefore, in some of the uses, corrosion rates may be comparatively high for the first few hours or even days of exposure, then may decline to extremely low steady state rates for the remaining time the cast iron is exposed to the corrosive environment. Nickel is used to improve the corrosion resistance of cast iron in a number of applications. Ni increases corrosion resistance by the formation of protective oxide film on the surface of the casting. Ni up to 4 % is added in combination with Cr for improving both the strength and corrosion resistance in the cast iron. The improved hardness and corrosion resistance achieved is particularly important for improving the erosion-corrosion resistance of the material. Ni addition also improves the corrosion resistance of cast iron to reducing acids and alkalis. Ni additions of 12 % or more are necessary to optimize the corrosion resistance of cast iron. However, Ni is not as common an alloying element in cast iron as either Si or Cr for the improvement of the corrosion resistance. It is mainly added as a strengthening and hardening element. Chromium is frequently added alone and in combination with Si and/or Ni to increase the corrosion resistance of cast iron. As with Ni, small addition of Cr is used to refine graphite and matrix microstructures. These refinements improve the corrosion resistance of cast iron in seawater and weak acids. Cr addition in the range of 15 % to 30 % improves the corrosion resistance of cast iron to oxidizing acids such as nitric acid (HNO3). Cr increases the corrosion resistance of cast iron by the formation of protective oxides on the surface of castings. The oxides formed resist oxidizing acids, but are of little use under reducing conditions. High Cr additions, like higher Si additions, reduce the ductility of cast iron. Copper is added to cast iron in special cases. Cu addition in the range of 0.25 % to 1 % increases the resistance of cast iron to dilute acetic acid (CH3COOH), sulphuric acid (H2SO4), and hydrochloric acid (HCl) as well as acid water from the mines. Small addition of Cu is also made to cast iron for improving the atmospheric corrosion resistance. Addition of up to 10 % of Cu is made to high Ni-Cr cast iron to increase corrosion resistance. The exact mechanism by which Cu improves the corrosion resistance of cast iron is not known. Molybdenum is an important alloying element in cast iron for increasing the strength and structural uniformity. Mo is also used to enhance corrosion resistance, particularly in high Si cast iron. It is mainly useful in HCl acid. As small as 1 % Mo is helpful in the corrosion resistance some high Si cast iron, but Mo is added in the range of 3 % to 4 % for the optimum corrosion resistance. Other alloying additions to cast iron normally have a minimal effect on corrosion resistance. V and Ti improve the morphology of graphite and matrix structure in cast iron and hence impart slightly increased corrosion resistance to cast iron. Few other additions are made to cast iron which has a substantial effect on corrosion resistance. Though the graphite shape and the amount of massive carbides present are critical to mechanical properties, these structural differences do not have a strong effect on corrosion resistance. Flake graphite structures can trap corrosion products and retard corrosion slightly in some of the uses. Under uncommon conditions, graphite can act cathodically with regard to the metal matrix and can accelerate the corrosion attack. The matrix structure has a minor influence on corrosion resistance, but the effect is small compared to that of composition. In gray irons, ferrite structure is normally the least resistant, and graphite flakes show the highest corrosion resistance. Pearlite and cementite show intermediate corrosion resistance. Shrinkage or porosity can reduce the corrosion resistance of cast iron parts. The presence of porosity allows the corrosive medium to enter the body of the casting and can provide continuous leakage paths for corrosives in pressure containing parts. Cast irons can be grouped into five basic classes based on corrosion resistance. These classes are discussed below. The first group consists of non -alloyed gray, white, malleable and ductile cast irons. This group represents the first and largest class of cast irons. All of these cast irons have C and Si contents of 3 % or less and there are no deliberate additions of Ni, Cr, Cu, and Mo. As a group, these cast irons show corrosion resistance which equals or slightly surpasses that of non-alloyed steels, but they show the highest rates of attack for cast irons. These cast irons are available in a wide variety of formations. The second group consists of low and moderately alloyed cast irons. This group constitutes the second highest class of cast irons. These cast irons also contain up to several percent of Ni, Cu, Cr, or Mo. As a group, these cast irons show two to three times the service life of non-alloyed cast irons. The third group contains high Ni austenitic cast irons. This group represents a third main class of cast irons for corrosion service. These cast irons contain large percentages of Ni and Cu and are fairly resistant to such acids as concentrated H2SO4 and phosphoric acid (H3PO4) at slightly higher temperatures, HCl acid at room temperature, and such organic acids such as CH3COOH, oleic, and stearic acids. When Ni percentages are more than 18 %, austenitic cast iron is nearly immune to alkali or caustics, though stress corrosion can occur. High Ni cast iron can be nodularized to yield ductile cast iron. The fourth group consists of high Cr cast irons. This group of corrosion resistant cast irons is basically white cast irons alloyed with Cr in the range of 12 % to 30 %. Other alloying elements can also be added to improve resistance to specific atmospheres. When Cr percentage is more than 20 %, high Cr cast iron shows good corrosion resistance to oxidizing acids, mainly HNO3 acid. High Cr cast irons are not resistant to reducing acids. They are used in saline solutions, organic acids, and marine and industrial environments. These cast irons display exceptional resistance to abrasion, and with proper alloying additions, they can also resist combinations of abrasives liquids, including some dilute acid solutions. The fifth group consists of high Si cast irons. The principal alloying element is Si in the range of 12 % to 18 %, with more than 14.2 % is needed to develop very good corrosion resistance. Cr and Mo are also used in combination with Si to develop corrosion resistance to specific atmospheres. High Si cast irons denote the most universally used corrosion resistant materials available at moderate cost. When percentage of Si is more than 14.2 %, high Si cast irons show very good resistance to H2SO4, HNO3, HCl, CH3COOH, and most other mineral and organic acids and corrosives. These cast irons show good resistance in oxidizing and reducing atmospheres and are not affected significantly by concentration or temperature. Exceptions to universal resistance are hydrofluoric acid (HF), fluoride salts, sulphurous acid (H2SO3), sulphite compounds, strong alkalis, and alternating acid-alkali conditions. Cast iron shows the same common forms of corrosion as other metals and alloys. Examples of the forms of corrosion witnessed in cast iron includes (i) uniform or general attack, (ii) galvanic or two- metal corrosion, (iii) crevice corrosion, (iv) pitting corrosion, (v) inter-granular corrosion, (vi) selective leaching, (vii) erosion-corrosion, (viii) stress corrosion, (ix) corrosion fatigue and fretting corrosion. Graphite corrosion is a form of corrosion which is unique to cast iron. It is a selective leaching attack. Graphitic corrosion is seen in gray cast iron in relatively mild atmospheres in which selective leaching of iron leaves a graphite network. Selective leaching of the iron takes place since the graphite is cathodic to iron and the gray iron structure establishes an excellent galvanic cell. This form of corrosion usually occurs only when corrosion rates are low. If the metal corrodes more rapidly, the entire surface, including the graphite, is removed, and more or less uniform corrosion occurs. Graphitic corrosion can cause significant problems because, although no dimensional changes occur, the cast iron loses its strength and metallic properties. Hence potentially dangerous situations can develop in pressure containing applications which cannot be even detected. Graphitic corrosion is seen only in gray cast irons. In both nodular and malleable iron, the lack of graphite flakes provides no network to hold the corrosion products together. Fretting corrosion is generally seen when vibration or slight relative motion occurs between parts under load. The relative resistance of cast iron to this form of attack is influenced by such variables as lubrication, hardness variations between materials, the presence of gaskets, and coatings etc. Pitting and crevice corrosion takes place when the presence of chlorides and/or crevices or other shielded areas presents conditions which are favourable to the pitting and/or crevice corrosion of cast iron. Pitting has been seen in such atmospheres as dilute alkylaryl sulphonates, antimony tri-chloride (SbCl3), and calm seawater. Alloying can influence the resistance of cast iron to pitting and crevice corrosion. As an example, Ni addition reduces the susceptibility of cast iron to pitting attack in calm seawater. High Si cast iron with Cr and/or Mo offers increased resistance to pitting and crevice corrosion. Though microstructural variations possibly exert some influence on susceptibility to crevice corrosion and pitting, there are only few incidences which are available for this relationship. Inter-granular attack is relatively rare in cast iron. In stainless steel, in which this type of attack is most frequently seen, inter-granular attack is related to Cr depletion adjacent to grain boundaries. Because only the high Cr cast iron depends on Cr to form passive films for resistance to corrosion attack, few incidences of inter-granular attack related to Cr depletion are available. The only reference to inter-granular attack in cast irons involves ammonium nitrate (NH4NO3), in which non-alloyed cast iron is reported to be inter-granularly attacked. Since this form of selective attack is relatively rare in cast iron, no significant references to the influence of either structure or chemistry on inter-granular attack are available. Erosion-corrosion in cast iron takes pace due to fluid flow. Fluid flow by itself or in combination with solid particles can cause erosion-corrosion attack. Two methods are known to increase the erosion-corrosion resistance of cast iron. In the first method the hardness of the cast iron can be increased through solid-solution hardening or phase transformation induced hardness increases. AS an example, additions of 14.5 % Si to cast iron cause considerable solid-solution hardening of the ferritic matrix. In such atmospheres as the sulphate liquors encountered in some of the industries, this hardness increase enables high Si cast iron equipment to be successfully used, while lower hardness non-alloyed cast iron fails rapidly by severe erosion-corrosion. Use of martensitic or white cast irons can also improve the erosion-corrosion resistance of cast iron as a result of hardness increases. In the second method, better inherent corrosion resistance can also be used to increase the erosion-corrosion resistance. Austenitic Ni cast iron can have hardnesses similar to non-alloyed cast iron, but may show better erosion-corrosion resistance due to the increased inherent resistance of Ni alloyed cast iron compared to non-alloyed cast iron. Microstructure can also affect erosion-corrosion resistance slightly. Gray cast iron generally displays better resistance than steel under erosion-corrosion conditions. This improvement is related to the presence of the graphite network in the gray cast iron. Iron is corroded from the gray iron matrix as in steel, but the graphite network that is not corroded traps corrosion products and this layer of corrosion products and graphite offers additional protection against erosion-corrosion attack. Stress corrosion cracking (SCC) is observed in cast iron under certain combinations of environment and stress. Since stress is essential to initiate SCC and since the design factors frequently limit stresses in castings to relatively low levels, SCC is not observed as often in cast iron as in other more highly stressed components. However, in certain situations, SCC can be a serious problem. Since non-alloyed cast iron is normally similar to ordinary steel in resistance to corrosion, the same atmospheres which cause SCC in steel are likely cause problems in cast iron. Atmospheres which may cause SCC in non-alloyed cast iron includes (i) sodium hydroxide (NaOH) solutions, (ii) NaOH-Na2SiO2 solutions, (iii) calcium nitrate [Ca(NO3)2] solutions, (iv) ammonium nitrate (NH4NO3) solutions, (v) sodium nitrate (NaNO3) solutions, (vi) mercuric nitrate [Hg(NO3)2] solutions, (vii) mixed acids (H2SO4-HNO3), (viii) hydrogen cyanide (HCN) solutions, (ix) seawater, (x) acidic hydrogen sulphide (H2S) solutions, (xi) molten sodium (Na) –lead (Pb) alloys, (xii) acid chloride solutions, and (xiii) oleum (fuming H2SO4). Graphite morphology can play an important role in SCC resistance in certain atmospheres. In oleum, flake graphite structures cause special problems. Acid tends to penetrate along graphite flakes and corrodes the iron matrix. The corrosion products formed build up pressure and eventually crack the cast iron. This problem is found in both gray and high Si cast irons, which have flake graphite morphologies, but is not seen in ductile cast iron that have nodular graphite shapes. No single grade of cast iron can resist all corrosive atmospheres. However, a cast iron can be identified which can resist most of the corrosives generally used in industries. Cast irons suitable for the more common corrosive atmospheres are described below. For H2SO4 acid applications non-alloyed, low alloyed and high Ni austenitic as well as high Si cast irons are used. Use of non-alloyed and low alloyed cast iron is limited to low velocity low temperature concentrated (more than 70 %) H2SO4. Non-alloyed cast iron is rarely used in dilute or intermediate concentrations, because corrosion rates are considerable. In concentrated H2SO4 acid as well as other acids, ductile cast iron is generally considered superior to gray cast iron, and ferritic matrix irons are superior to pearlitic matrix cast irons. In hot, concentrated acids, graphitization of the gray cast iron can occur. In oleum, non-alloyed gray cast iron corrodes at very low rates. However, acid penetrates along the graphite flakes, and the corrosion products form and build up sufficient pressure to split the cast iron. Interconnecting graphite is thought to be essential to cause this form of cracking. Hence ductile and malleable cast irons are normally acceptable for this use. Some potential galvanic corrosion between cast iron and steel has been observed in 100 % H2SO4 acid. High Ni austenitic cast iron shows acceptable corrosion resistance in room temperature and slightly higher temperature uses. This cast iron is adequate over the entire range of H2SO4 concentrations, but is a second choice compared to high Si cast iron. High Si cast iron is the ideal choice among the cast irons and perhaps among the commonly available engineering materials for resistance to H2SO4. This cast iron resists the entire H2SO4 concentration range at all temperatures up to boiling. Rapid attack occurs at concentrations above 100 % and in uses containing free sulphur trioxide (SO3). High Si cast iron is comparatively slow to passivate in H2SO4 service. Corrosion rates are relatively high for the first 24 hours to 48 hours of exposure and then decrease to very low steady state rates. For the application in nitric acid, all types of the cast irons, except high Ni austenitic cast iron find some use. The use of non-alloyed cast iron in HNO3 acid is limited to low temperature low velocity concentrated acid service. Even in this use, caution is needed to avoid dilution of acid because the non-alloyed and low alloyed cast irons both corrode very rapidly in dilute or intermediate concentrations at any temperature. High Ni austenitic cast iron shows essentially the same resistance to HNO3 acid as non-alloyed cast iron and hence cannot be economically justified for this use. High Cr cast iron with Cr content more than 20 % gives very good resistance to HNO3 acid, especially in dilute concentrations. High temperature boiling solutions attack these grades of cast iron. High Si cast iron also provides very good resistance to HNO3 acid. Resistance is shown over basically all concentration and temperature ranges with the exception of dilute and hot acids. High Si cast iron equipment has been used since many years in the manufacture and handling of HNO3 acid mixed with other chemicals, such as H2SO4, sulphates, and nitrates. Contamination of the HNO3 acid with HF, such as might be experienced in pickling solutions, can accelerate attack of the high Si cast iron to unacceptable levels. For the application in the HCL acid, use of cast iron is comparatively limited. Non- alloyed cast iron is unsuitable for any HCl acid service. Rapid corrosion occurs at a pH of 5 or lower, particularly if appreciable velocity is involved. Aeration or oxidizing conditions, such as the presence of metallic salts, result in rapid destructive attack of non-alloyed cast iron even in very dilute HCl acid solutions. High Ni austenitic cast iron provides some resistance to all HCl acid concentrations at room temperature or below. High Cr cast iron is not suitable for HCl acid services. High Si cast iron provides the best resistance to HCl acid amongst any cast iron. When alloyed with 4 % to 5 % Cr, high Si cast iron is suitable for all concentrations of HCl acid at 28 deg C. When high Si cast iron is alloyed with Cr, Mo, and higher Si levels, the temperature for use can be increased. In concentrations up to 20 %, ferric ions (Fe3+) or other oxidizing agents inhibit corrosion attack on high Si cast iron alloyed with Cr. With the acid concentrations of above 20 %, oxidizers accelerate attack on the cast iron. Similar to H2SO4 acid, corrosion rates in high Si cast iron are initially high in the first 24 hours to 48 hours of exposure then decrease to very low steady state rates. For the application in the H3PO4 acid, all the cast irons find some application but the presence of contaminants need to be carefully evaluated before selecting the cast iron for this use. Non-alloyed cast iron finds slight use in H3PO4, with the exception of concentrated acids. Even in concentrated acids, use is very limited by the presence of fluorides, chlorides, or H2SO4 acid. High Ni cast iron finds some application in H3PO4 acid at and slightly above room temperature. This cast iron can be used over the entire concentration range of H3PO4 acid. Impurities in the acid greatly restrict the applicability of this grade of the cast iron. High Cr cast iron usually shows low rates of attack in H3PO4 acid up to 60 % concentration. High Si cast iron shows good-to-excellent resistance at all concentrations and temperatures or pure acid. The presence of fluoride ions (F-) in H3PO4 acid makes the high Si cast iron unacceptable for use. Since the organic acids and compounds are normally not as corrosive as mineral acids, cast iron finds many applications in the handling of these materials. Non-alloyed cast iron can be used to handle concentrated CH3COOH and fatty acids, but is attacked by more dilute solutions. Non-alloyed cast iron is also used to handle methyl, ethyl, butyl, and amyl alcohols. If the alcohols are contaminated with water and air, discoloration of the alcohols can occur. Non-alloyed cast iron can also be used to handle glycerine, though slight discoloration of the glycerine can happen. Austenitic Ni cast iron shows satisfactory resistance to CH3COOH, oleic acid, and stearic acid. High Cr cast iron is suitable for CH3COOH, but is more severely corroded by formic acid (HCOOH). High Cr cast iron is very good for lactic and citric solutions. High Si cast iron shows very good resistance to most organic acids, including HCOOH and oxalic acid, in all temperature and concentration ranges. High Si cast iron also shows very good resistance to alcohols and glycerine. In case of alkali solutions, it is necessary that the selection of the cast iron is made which is distinctly different from those of acid solutions. Alkalis include sodium hydroxide (NaOH), potassium hydroxide (KOH), sodium silicate (Na2SiO3), and similar chemicals which contain sodium (Na), potassium (K), or lithium (Li). Non-alloyed cast iron shows normally good resistance to alkalis which is normally equivalent to that of steel. Non-alloyed cast iron is not attacked by dilute alkalis at any temperature. Non-alloyed cast iron is attacked by hot alkalis having concentrations of more than 30 %. If corrosion rates of less than 0.25 mm/annum is required then temperatures are not to exceed 80 deg C for concentrations up to 70 %. Ductile and gray cast irons show about equal resistance to alkalis, but ductile cast iron is susceptible to cracking in highly alkaline solutions while gray cast iron is not. Alloying with Ni in the range of 3 % to 5 % significantly improves the resistance of cast iron to alkalis. High Ni austenitic cast iron shows even better resistance to alkalis than non-alloyed or low Ni cast iron. High Si cast iron shows good resistance to relatively dilute solutions of NaOH at moderate temperatures, but is not to be used for more concentrated solutions at higher temperatures. High Si cast iron is normally economical in use over non-alloyed and Ni cast iron in alkali solutions only when other corrosives are involved for which the lesser alloyed cast irons are unsuitable. High Cr cast iron has lower resistance to alkali solutions and is usually not used for alkali services. Atmospheric corrosion is basically of interest only for non-alloyed and low alloy cast irons. Atmospheric corrosion rates are determined by the relative humidity and the presence of various gases and solid particles in the atmospheric air. The high humidity, sulphur dioxide (SO2) or similar compounds found in many industrial atmospheres, and chlorides found in marine environments increase the rate of attack on cast iron. Cast iron typically shows very low corrosion rates in industrial atmospheres which is normally less than 0.13 mm/annum and the cast iron is generally found to corrode at lower rates than steel structures in the same atmosphere. White cast iron shows the lowest rate of corrosion of the non-alloyed cast irons. Pearlitic cast iron is usually more resistant than the ferritic cast iron to atmospheric corrosion. In marine atmospheres, non-alloyed cast iron also shows relatively low rates of corrosion. Low alloy additions are sometimes made for further improving the corrosion resistance. Higher alloy additions are even more beneficial, but are rarely justified. Gray cast iron offers some added resistance over ductile cast iron in marine environments. Use of cast iron in soils is basically limited to non-alloyed and low alloyed cast iron. Corrosion in soils is a function of soil porosity, drainage, and dissolved constituents in the soil. Irregular soil contact can cause pitting. Poor drainage increases corrosion rates considerably above the rates in well drained soils. Neither cast iron structure nor the graphite morphology has an important influence on the corrosion of cast iron in soils. Some alloying additions are made to improve the resistance of cast iron to attack in soils. As an example, 3 % Ni addition to cast iron is made to reduce initial attack in cast iron in poorly drained soils. Alloyed cast iron also shows better resistance than non-alloyed or low alloyed cast iron, but is rarely used for soil applications, because non-alloyed cast iron normally has long service lives. Anodes placed in soils are frequently constructed from high Si cast iron. The high Si cast iron is not required to resist the basic soil environment but rather to extend service life when subjected to the high electrical current discharge rates commonly used in protective anodes. Non-alloyed and low alloyed cast irons are the main cast irons which are used in water. The corrosion resistance of non-alloyed cast iron in water is determined by its ability to form protective scales. In hard water, corrosion rates are normally low because of the formation of calcium carbonate (CaCO3) scales on the surface of the cast iron. In softened or deionized water, the protective scales cannot be fully developed and hence some corrosion occurs. In industrial waste waters, corrosion rate is primarily a function of the contaminants present. Acid water increases corrosion, but alkaline water lowers the corrosion rate. Chlorides increase the corrosion rate of non-alloyed cast iron, though the influence of chlorides is small at a neutral pH. Seawater causes some special problems for the use of cast iron. Gray cast iron may experience graphitic corrosion in calm seawater. It is also be galvanically active in contact with most stainless steels, Cu-Ni alloys, Ti, and Hastelloy. Since these materials are often used in seawater structures, this potential for galvanic corrosion is required to be considered. In calm seawater, the corrosion resistance of cast iron is not greatly affected by the presence of crevices. However, intermittent exposure to seawater is very corrosive to non-alloyed cast iron. Use of high alloy cast iron in seawater is relatively limited. High Ni austenitic cast iron is used to increase the resistance of cast iron components to pitting in calm seawater. High Si cast iron is used to produce anodes for the anodic protection systems used in seawater and brackish water. The presence of salts in water can have intense effects on the selection of suitable grades of cast iron. Non- alloyed cast iron shows very low corrosion in such salts as cyanides, silicates, carbonates, and sulphides, which hydrolyze to form alkaline solutions. However, in salts such as ferric chloride (FeCl3), cupric chloride (CuCl2), stannic salts, and mercuric salts, which hydrolyze to form acid solutions, non-alloyed cast iron experiences much higher rates of corrosion. In salts which form dilute acid solutions, high Ni cast iron is used. More acidic and oxidizing salts, such as FeCl3, usually necessitate the use of high Si cast iron. Chlorides and sulphates of alkali metals yield neutral solutions, and non-alloyed cast iron shows very low corrosion rates in these solutions. More highly alloyed cast iron also shows low rates, but cannot be economically justified for this application. Non- alloyed cast irons are suitable for oxidizing salts, such as chromates, nitrates, nitrites, and permanganates, when the pH is neutral or alkaline. However, if the pH is less than 7, corrosion rates can increase significantly. At the lower pH with oxidizing salts, high Si cast iron is normally used. Ammonium salts are generally corrosive to non-alloyed iron. High Ni, high Cr, and high Si cast iron provides good resistance to these salts. Non-alloyed cast iron is used as a melting crucible for such low melting metals as Pb, zinc (Zn), Cadmium (Cd), magnesium (Mg), and aluminum (Al). Ceramic coatings and washes are sometimes used to inhibit metal attack on the cast iron. Cast iron can also be used in HCl and chlorine gases. In dry HCl gas, non-alloyed cast iron is suitable to 200 deg C, while in dry Cl gas, unalloyed cast iron is suitable to 175 deg C. If moisture is present, non-alloyed cast iron is unacceptable at any temperature. Four general types of coatings are used on cast iron to enhance corrosion resistance. These are (i) metallic, (ii) organic, (iii) conversion, and (iv) enamel coatings. Coatings on cast iron are generally used to improve the corrosion resistance of non-alloyed and low alloy cast iron. High alloy cast iron is rarely coated. Metallic coatings are used to improve the corrosion resistance of cast iron. These coatings can either be sacrificial metal coatings, such as Zn, or barrier metal coatings, such as Ni- P. From a corrosion viewpoint, these two types of coatings have important differences. Sacrificial coatings are anodic when compared to cast iron, and the coatings corrode preferentially and protect the cast iron substrate. Small cracks and porosity in the coatings have a minimal overall effect on the performance of the coatings. Barrier coatings are cathodic compared to cast iron, and the coatings can protect the cast iron substrate only when porosity or cracks are not present. If there are defects in the coatings, the service atmosphere attacks the cast iron substrate at these imperfections, and the galvanic couple set up between the relatively inert coating and the casting can accelerate attack on the cast iron. Many methods are used to apply metallic coatings to cast iron. Cast irons can be electroplated, hot dipped, flame sprayed, diffusion coated, or hard faced. Zn is one of the most widely used coatings on cast iron. Although Zn is anodic to cast iron, its corrosion rate is very low, and it provides relatively long term protection for the cast iron substrate. A small amount of Zn can protect a large area of cast iron. Zn coatings provide optimum protection in rural or arid areas. Other metal coatings are also normally used on cast iron. Cd provides atmospheric protection similar to that Zn. Tin (Sn) coatings are frequently used to improve the corrosion resistance of equipment intended for food handling, and Al coatings protect against corrosive atmospheres containing S fumes, organic acids, salts, and compounds of nitrate-phosphate chemicals. Pb and Pb-Sn coating are mainly used to improve the corrosion resistance of cast iron castings to H2SO3 and H2SO4 acids. Ni-P diffusion coatings offer corrosion resistance approaching that obtainable with stainless steel. Organic coatings are applied to cast iron for providing short term or long term corrosion resistance. Short term scale preventatives include oils, solvents, petroleum-based inhibitors and film formers dissolved in petroleum solvents, emulsified petroleum base coatings modified to form a stable emulsion in water, and wax. For longer term protection and resistance to more corrosive atmospheres, rubber base coatings, bituminous paints, asphaltic compounds, or thermoset and thermoplastic coatings are used. Rubber base coatings include chlorinated rubber neoprene, and Hypalon. These coatings are noted for their mechanical properties and corrosion resistance but not for their decorative appearance. Bituminous paints have very low water permeability and provide high resistance in cast iron castings exposed to water. Use of bituminous paints is limited to applications that need good resistance to water, weak acids, alkalis, and salts. Asphaltic compounds are used to increase the resistance of the cast iron to alkalis, sewage, acids, and continued exposure to tap water. Their application range is similar to that of bituminous paints. Cast irons are also lined with thermoset and thermoplastics, such as epoxy and polyethylene, to resist attack by fluids. Fluorocarbon coatings offer superior corrosion resistance except in abrasion services. Fluorocarbon coatings applied to cast irons include such materials as poly-tetra-fluoro-ethylene (PTFE), per-fluoro-alkoxy resins (PFA), and fluorinated ethylene polypropylene (FEP). Fluorocarbon coatings resist most common industrial uses and can be used up to 200 deg C. Cast iron lined with fluorocarbons is very competitive with stainless, Ni-base, and even Ti and Zr (zirconium) materials in terms of range of services covered and product cost. Conversion coatings are produced when the metal on the surface of the cast iron reacts with another element or compound to produce an iron containing compound. Common conversion coatings include phosphate coatings, oxide coatings, and chromate coatings. Phosphate coatings improve the resistance of cast iron to corrosion in sheltered atmospheric exposure. If the surface of the casting is oxidized and black iron oxide or magnetic is formed, the corrosion resistance of the cast iron can be enhanced, particularly if the oxide layer is impregnated with oil or wax. Chromate coatings are formed by immersing the cast iron castings in an aqueous solution of chromic acid (H2CrO4) or Cr salts. Chromate coatings are sometimes used as a supplement to Cd plating in order to prevent the formation of powdery corrosion products. The overall benefits of conversion coatings are small with regard to atmospheric corrosion. In the enamel coating of cast irons, glass frits are melted on the surface and form a hard, tenacious bond to the cast iron substrate. Good resistance to all acids except HF can be obtained with the proper selection and application of the enamel coating. Alkaline resistant coatings can also be applied, but they do not show the same general resistance to alkalis as acids do. Proper design and application are essential for developing enhanced corrosion resistance on cast irons with enamel coatings. Any cracks, spalling, or other coating imperfections may permit rapid attack of the underlying cast iron. Cast iron provides very good resistance to a wide range of corrosion atmospheres when correctly matched with the service environment for which it is intended for use. The basic parameters to consider before selecting appropriate cast iron for corrosion service include (i) concentration of solution components, (ii) contaminants, even at parts per million (ppm) levels, (iii) pH of solution, (iv) temperatures and its potential range and rate of change, (v) degree of aeration, (vi) percent and type of solids, (vii) continuous or intermittent operation, (viii) upset potential (maximum temperature and concentration), (ix) unusual conditions, such as high velocity and vacuum, and (x) materials currently used in the system and potential for galvanic corrosion. Although it is advisable to consider each of the parameters before ultimate selection of a cast iron, the information needed to assess all variables of importance properly is often not available. In such cases, introduction of test coupons of the candidate materials into the process stream are to be considered before a decision is made. If neither test coupons nor complete service data are viable alternatives, consultation with a reputable manufacturer of the equipment or the cast iron with a history of applications in the area of interest need to be considered.